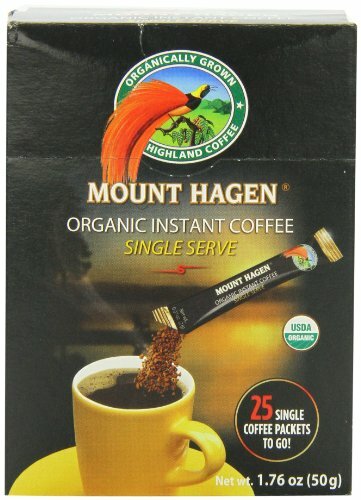 Mount Hagen instant organic coffee is organically grown highland coffee made from 100% Arabica beans. It is the first certified organic freeze dried coffee in the world. Mount Hagen is 100% organic certified by EcoCert in accordance with the organic standards of the U.S. Department of Agriculture. Mount Hagen has been carefully selected and separately harvested to bring you the highest quality, mild and naturally rich in flavored coffee. The freeze-dried coffee process is achieved without the use of any form of preservatives or additives. Our coffees are from plantations of the best cultivation areas in the world. These highland coffees are quarantined to be organically grown without the use of any artificial chemicals such as herbicides, pesticides, fungicides or fertilizers. If you have any questions about this product by Mount Hagen, contact us by completing and submitting the form below. If you are looking for a specif part number, please include it with your message.